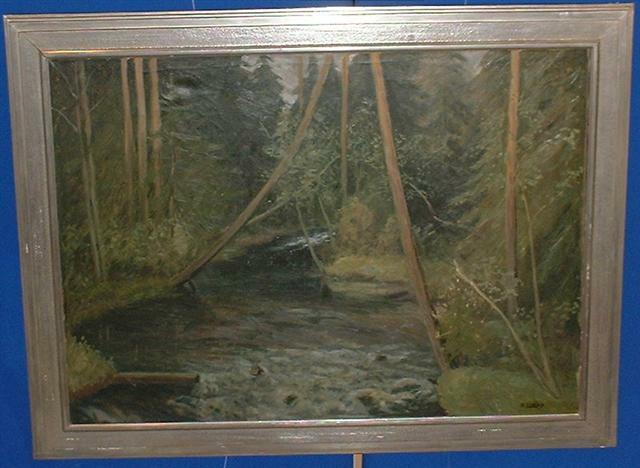 STRONG>SOLD!Anders Loman rented Karlssons studio in the 1940ths situated in the city Falun in Dalecarlia. Anders Loman studied 3 years in Valand (Sweden) and went to Paris, Austria and Germany. This is the second big oil painting by Anders Loman the older one that now is being sold by Gallery JT Ltd.
Another painting by Anders Loman the older one in about the same size was sold for 3.012 USD. Anders Loman the older one (1879-1953) went to art schools: Valand Gothenburg Sweden Sweden and abroad. He comes from Dalecarlia and painted many paintings from his home landscape Dalecarlia in Sweden until 1952. Anders Loman went to Paris, Germany, Austria, France , Denmark and Italy in 1921. Gallery JT LTD has got 2 more paintings by Anders Loman the older one for sale in the gallery at Promenaden 29 in Falun, Dalecarlia Sweden and furthermore two paintings painted by Anders Loman the younger one. Exclusive art is stored safely.